Five years ago, my 9-year old daughter and I were approaching the finish line of the Boston Marathon when bombs exploded in two different sites. I will never forget the feelings I had as a father shielding his daughter from the surrounding chaos, a husband looking for his wife who was running the marathon, and a surgeon trying to get to the hospital to help those who were injured. Although three people died that day, nearly 300 others who were injured were saved by a combination of heroic efforts from bystanders and nearby medical and emergency personnel. First responders, both civilian and professional, used belts, apron strings, and even new clothes to control bleeding from injured limbs. At the most basic level, these pre-hospital heroes employed improvised versions of an often-overlooked device: the tourniquet. The goal of a tourniquet is to compress an injured blood vessel just tightly enough to stop the bleeding so the wounded individual can be moved elsewhere for definitive care. Once a commonly used device (in the 1930s, the Girl Scout First Aid Badge was adorned with a tourniquet), it fell out of favor due to fears that completely stopping blood flow to a limb would cause the surrounding tissue and nerves to suffer irreversible damage, and lead to an amputation. Although the use of tourniquets for civilian trauma continues to be debated, there is no debate about their use in the military. Today, U.S. military service personnel carry combat action tourniquets with their gear and are expected to use them to prevent serious blood loss from arm or leg wounds. I have been curious about the use of tourniquets for major trauma for more than a decade. My initial interest was academic. In a 2008 report in the Journal of Emergency Medical Services, several colleagues and I showed that proper use of tourniquets by first responders controlled life-threatening bleeding from extremity injuries without damaging nerves and blood vessels. 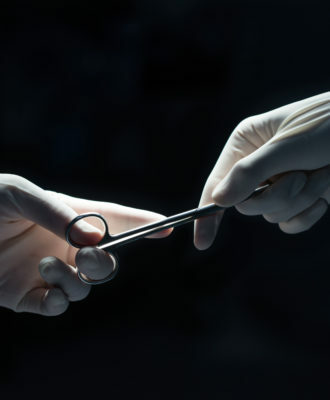 After the Boston Marathon bombings, I saw firsthand in my work as a vascular surgeon caring for bombing survivors at Boston Medical Center how valuable tourniquets can be. I have since bought my own military-grade combat action tourniquet online, for just $26.99. Why? When patients arrive in my hospital’s emergency department with an injury to a blood vessel, I work with a team of physicians and nurses to stop the bleeding and save life and limb. But outside the hospital, I wasn’t sure how much help I could give someone with a bleeding wound, other than using my belt or shirt as a makeshift tourniquet. Now that I have a real tourniquet, I feel more confident I could save someone’s life in an emergency. Maybe it will be a stranger’s, maybe my daughter’s or my wife’s, and maybe even my own. In April 2015, the American College of Surgeons Hartford Consensus meeting focused on our nation’s threat from intentional mass-casualty events, and how to implement strategies for effective bleeding control. In addition to an increase in education for public and professional responders, the committee advocated that bleeding-control bags containing tourniquets and other medical supplies be placed in public locations, including next to automated external defibrillators. A few months later, President Obama’s White House launched the “Stop the Bleed” campaign to empower bystanders to act as immediate responders and to raise awareness about lifesaving strategies for bleeding control. When I was 14, the grand warning from my parents when I left the house was “Look both ways before crossing the street.” Fast-forward 30 years, years that included mass shootings at the Sandy Hook Elementary School in Connecticut; Columbine High School in Colorado; a movie theater in Aurora, Colo.; the Pulse nightclub and Stoneman Douglas High School, both in Florida; and others. Sadly, this is our world today, one we are becoming accustomed to with each passing tragedy. My wife and I tried to ensure that the impact of the marathon bombings and the flurry of senseless shootings did not reach our daughter. We wanted her to keep on being a kid, oblivious to the world around her, much as I was at the age of 14. But after the recent mass school shooting in Florida, our conversations have taken on a different focus. Although we do not let threats of violence prevent us from moving forward with life, we need her to know how to take an active part in mitigating the threats she may face. 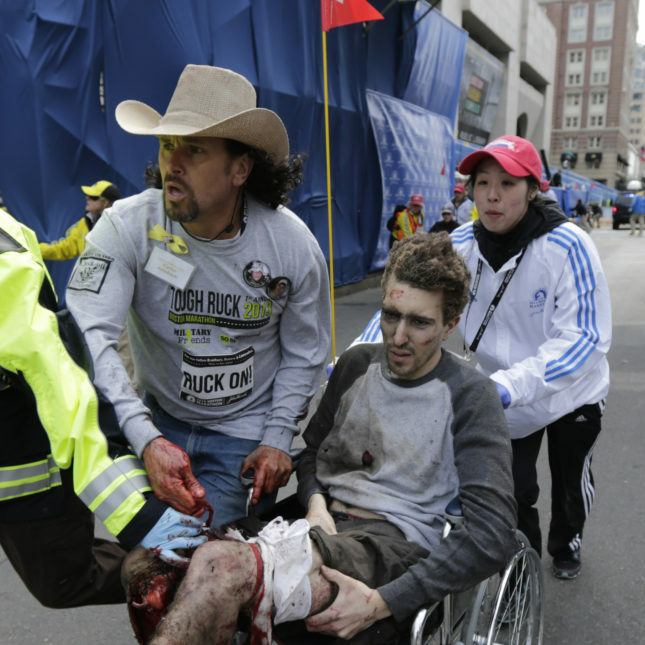 Given my experiences with the Boston Marathon bombings and their aftermath, I want to believe that my family has met its quota of mass casualty events for one lifetime. But I recognize this may not be the case as the world continues to change, and I therefore have new fears as both a dad and a surgeon. Until politicians and the public can figure out ways to stem violence on our streets and in our schools, then a worthwhile tactic to save innocent lives might be to increase the availability of tourniquets. It seems logical to place them, costing $26.99 each, next to defibrillators that cost about $2,500 each. To answer the obvious question: I have never uttered to my daughter the phrase “Sweetheart, don’t forget your tourniquet” — at least not yet. But in this new world we are facing, someday soon I just might. Jeffrey Kalish, M.D., is director of endovascular surgery at Boston Medical Center in Boston and associate professor of surgery at Boston University School of Medicine. Article takes forever to get to its point. Relevant paragraph near the end. Agree with comment that carrying a tourniquet in the event one encounters a marathon bombing or a school shooting is silly — is it useful in an automobile accident? This “debate” makes no sense. In the OR we routinely put tourniquets on thighs to stop blood supply to the knee for total knee replacement, for two hours. The complication we see most often is ischemic nerve damage. It also makes no sense to withhold life-saving therapy if a life is at stake. Do you worry about neck trauma if you have to perform an emergency tracheotomy? Okay, I’m sold. Where do I buy this $26.99 military-grade tourniquet? I already carry gauze and bandages in my glove compartment, and this seems like something else I should have. Sorry about posting the wrong link. The correct site is https://www.tacmedsolutions.com/. When I was seven, my life was saved by someone who knew how to tie a tourniquet. While I think it’s unlikely that people will start carrying tourniquets, the Boston event proves that, like CPR, learning to tie a tourniquet is not that difficult an achievement to attain. $2500 defibrillator? What did they put in it to warrant that price? I designed computer circuits all my professional life. I know what it takes to get a prescribed current/voltage pulse and feedback if necessary to control it. And it’s not close to $2500. Like my commercial O2 concentrater for my COPD. The identical product in medical grade costs 5 times as much. How about a little pricing sanity instead of greed? This is terrible advice and a waste of money, even at $27. In our “new world” bombings, mass shootings, etc. are still extremely rare. Yes, the news media (like STAT) loves them and airs them constantly. But in reality your teenage daughter and my teenage son are far more likely to die because of suicide, drug overdose, or automobile accident. We should be spending our money and efforts on preventing these. Re auto deaths. My daughter’s German au-pairs put the vast majority of teen-age American drivers to shame. It costs a few thousand to get a license in Germany, but they’re taught to “DRIVE”, not “OPERATE” a car. The majority of Americans don’t know the difference. They’re not taught. I’m a self-taught driver ( age 92 ) who has always driven at the top 10% of the speed range. My dozen accidents have all occurred below 15 mph when my attention got reduced and in areas of confusion ( parking lots ). On the road, I keep my cell phone off, I drink only water from an open bottle, don’t turn my head to talk to passengers, no radio or ANYTHING else to distract me. Teach DRIVING, not operating. Disagree. Bleeding control skills (and the eq to do it) could help in someone who is attempting suicide or someone who is hurt in a car accident. These skills and equipment are more than just for mass casualties, even if that’s the impetus for it. CPR was probably seen as a waste of time and energy at some point, but evidence has pointed to the contrary–I imagine we’ll see the same basic techniques for stopping bleeding if this reaches critical mass.